I really enjoyed All’s Fair in Love and Scandal. Caroline Linden manages to pack in a whole lot of great characters, emotional story arcs, and plot within the shorter format. Novellas are quite tricky to pull off because readers expect the same good plot, well developed characters, and happy ending as they find in full length novels, but at a fraction of the word count. Douglas Bennet is a man who has the world at his feet-good looks, fortune, social status, and a happy, comfortable carefree life. However, his world gets turned upside down when he accepts a wager from a friend to unmask the identity of a mysterious author. In his quest to win this wager, he crosses paths with widow Madeline Wilde. I thought Caroline wrote a great character arc for Douglas. Throughout his whole life, he has had everything he wants or needs handed to him. Things have always come easily to him and he has rarely, if ever, encountered an obstacle or something he couldn’t obtain with his money or charm. But Madeline proves to be a tough nut to crack, and for the first time in his life, Douglas has to dig deep, rise to the occasion, and put himself on the line to earn the woman he loves. He comes to learn that the best things in life mean more when you earn it through hard work, sacrifice, and risk instead of it being handed to you. While Madeline appears to be a barely respectable widow who keeps to herself, there is more to her than meets the eye. I liked Madeline almost immediately. She is a strong, resourceful person who uses her intelligence and ingenuity to support herself after her husband dies. Using her social connections within the ton, she is now a gossip journalist for a small newspaper. Given her new profession and her complicated family background, she is naturally suspicious of Douglas when he first approaches her for an introduction, and his subsequent overtures and attempts to win her over. I loved that Madeline eventually learns to let go the baggage of her past, and learns to trust in her heart, and in a rogue like Douglas. Indeed, there is a scene where Madeline puts the adage “If you love someone, let them go. If they come back, they’re yours. If not, they were never yours to begin with” to the test. Luckily, we know that both Madeline and Douglas will pass this test and learn to believe and trust in each other. There is a great array of secondary characters in this book, including Mr. Nash the cat and Constance, Madeline’s maid. I found Liam MacGregor, Madeline’s business partner and editor very intriguing, as well as Sir Philip Albright, Douglas’s competitor to unmask Lady Constance, turned ally. I sense hero potential in both characters, and am looking forward to seeing if I’m right or not. 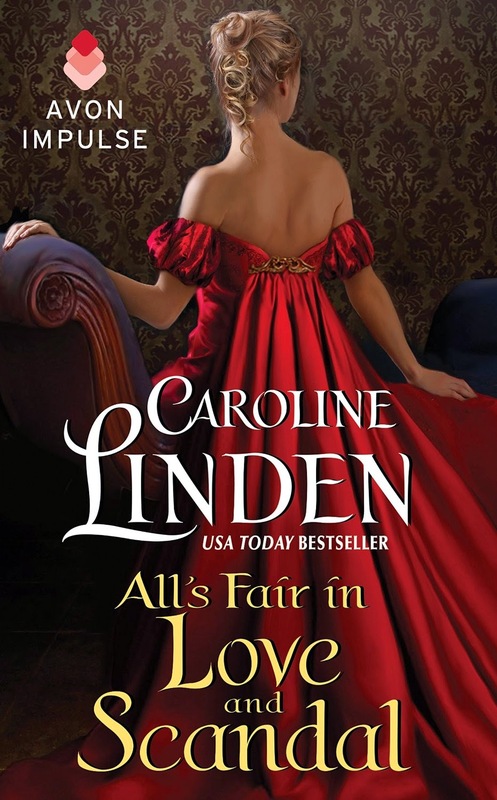 I definitely recommend All’s Fair in Love and Scandal for any reader who enjoys novellas with great compelling characters who you can’t help but root for with a good dollop of humor and emotional depth on top. The running theme throughout the Scandal series is 50 Ways to Sin, a very naughty and explicit collection that tells the story of Lady Constance and her myriad lovers and trysts. The author of 50 Ways to Sin still remains unknown, but I’m hoping the next book in the series will finally clear up that mystery. oh this one sounds so good. I do love this author and I can't wait to read this one. Sounds like an interesting read - pretty cover too. The shorter format can be a challenge, but good authors have proven over and over again it can contain a gem. I have had little time to read lately and have been turning to the shorter books and anthologies for reading enjoyment. This one will be perfect. I do enjoy her books. Nice review Lisa. I haven't read this one yet but I always enjoy a good read by Caroline Linden.